We provide weekly pool service for a small pool and spa in a Del Mar condominium complex about a mile from the beach on the San Diego coastline. The swimming pool and hot tub are serviced two times a week in the summer and once a week in the winter months. Both the pool and spa are maintained up to the San Diego County Health Department standards, including the water chemistry, the flow rates and the log books. 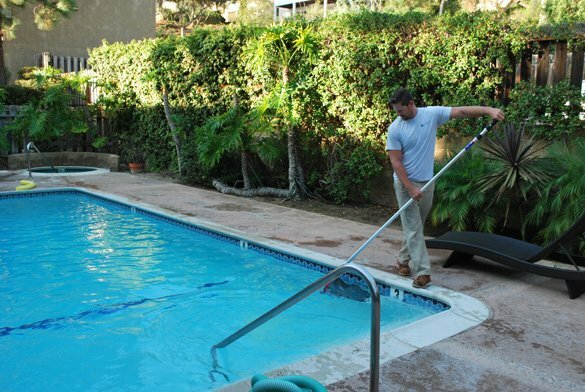 During every pool service visit, our pool service tech vacuums the swimming pool and hot tub, cleans the pool tile and depth marker tiles with soap and a scrub brush and balances the pool water. Also the skimmer baskets, pool and spa circulation pump baskets and spa booster pump basket are emptied and cleaned. Our commercial pool service also includes providing up to date safety signs for compliance and pool equipment repairs when they are needed. As part of our weekly service we also look at the safety condition of the pool and spa surface, decking and gates. We make sure the stainless steel safety handrails in the pool and spa are tight and safe. Also the condition of the non slip pool deck, the tile and the safety grip coping are taken into account. The pool and hot tub are separate bodies of water and each have their own set of equipment. 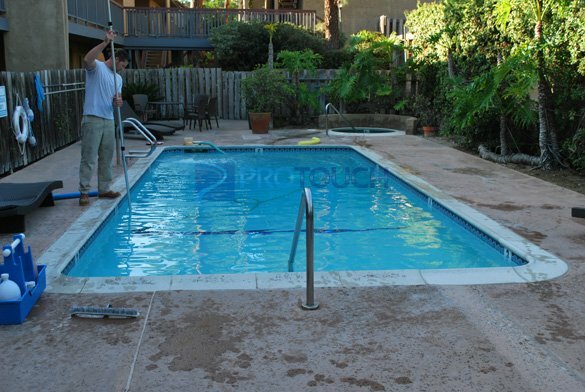 Our pool service technicians provide pool and spa filter cleans as they are needed as well. 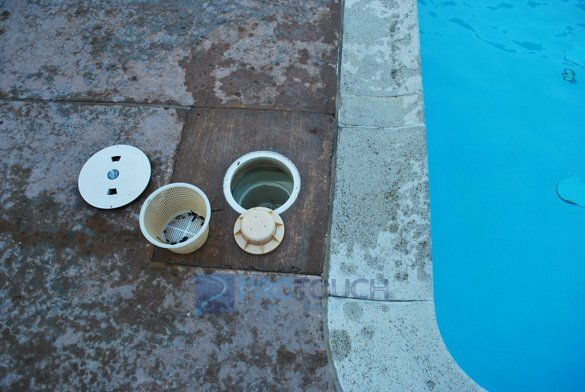 The goal of ProTouch Pool Services is to make sure all of our San Diego commercial pool and hot tub service accounts are up to code and safe to use at all times.